I have talked with a couple of you on and off and told you what I’m doing as far as losing weight and working out, however I really haven’t gotten into much detail so I’ll do that now. Before I go any further detail about my workout and diet, I want to say that I’m just an idiot that has read a bunch of stuff and I am experimenting with what works for me. I do not have the answers and I’m merely showing you what my progress is so far and what I’ve done to get here, and the foundation I have established for the future. First just a little history, I graduated high school at 165 lbs and I was about 6’2”. My first year of college after I had put on some weight I was measured at 11% body fat at around 180 lbs when I was 19. In my early 20’s I was 6’4 and in the 240 lb range except for the period when I was 25 and in a law enforcement academy (about 200 lbs then). After the academy I blew up like a whale, and my heaviest weight was somewhere over 320 lbs (I don’t know exactly as scales were not my friend). When I was going through the divorce I dropped down to about 240 lbs due to stress and not much appetite. The only thing I ate for several months was nonfat Greek yogurt. I don’t know for sure but I believe this caused the issues with my gallbladder which was subsequently removed. If you don’t know the gallbladder stores bile that the liver produces and excretes it when there is high fat in your food. Simply put your liver produces bile from fat and cholesterol in your body/bloodstream. I say this just to illustrate where I’m coming from. Mid 30’s I have been pretty steady between 250-270 lbs. I also started to do some weightlifting sporadically. Skip forward to getting more serious about weightlifting in February 2015 I bought my home gym and started taking it more seriously. Around the same time I began a new career that involved quite a bit of travel. Once that travel started I found it easy to stop working out, or work out very infrequently. I realized that working out infrequently does absolutely no good in helping you achieve any goals. You have to stick to it to gain anything. As I alluded to above I have some special dietary concerns not having a gallbladder. I decided to ignore those completely and push ahead with what I wanted to do. I read a book called Fitness Confidential by Vinnie Tortorich and starting listening to his podcast. He has a simple philosophy called NSNG (No Sugar No Grain) and it got me very interested so I started reading more. His co-host on the podcast has an absolutely amazing cookbook called Eat Happy. I highly recommend anyone wanting to get started in the low-carb lifestyle to read her book. I read a book called Good Calories, Bad Calories by Gary Taubes and his 2 other books, Why We Get Fat, and The Case Against Sugar. In summary, these books all challenge the current nutrition paradigm of low-fat/high-carb eating and the benefits of a ketogenic diet. Ketosis is not ketoacidosis. The former is a state in which your body is using internal fat reserves and dietary fat as the primary energy source, the latter is a horribly destructive condition as a result of diabetes. You can find many articles on ketosis so I won’t go into detail about exactly what it is, but you get your body into that state buy eating less than 50 grams of carbs per day. My daily carb goal is 25 grams. I have also recently stumbled onto the work of Dr. Jason Fung with his work on the benefits of fasting and IF (intermittent fasting). He also has a great book titled The Obesiety Code. There are many IF methodologies including 18/6 (fast for 18 hours a day and eat only in 6-hour window) 20/4, 16/8. I tried all of those as an experiment and none seemed to have much effect other than a gain in mental clarity that comes with not eating or worrying about what to eat every couple of hours. My current fasting schedule is 3-24 hour fasts per week which I will detail below. I had many follies and stumbles along the way but if the past 6 or so weeks are any indication I’ve found a formula that has worked for me. I figured mine using this calculator. I then plug these numbers into MyFitnessPal and use it to track everything. I do 3-24 hour fasts per week, Monday, Wednesday, Friday. I eat dinner Sunday, then don’t eat again until Monday dinner, eat normally Tuesday, skip breakfast and lunch Wednesday etc. During my fasting periods the only calories I consume are from heavy whipping cream or half and half in my coffee, and that is usually under 300-400 calories. You can read all about the benefits of fasting all over. Most religions have some sort of fasting as well. The reason I believe fasting works is that since I am already in a ketogenic state, this puts it on overdrive. My weightlifting workouts are also on my fasting days which further increases burning fat. I am a beginner weightlifter. Go ahead, Google “beginner weightlifting routine.” I’ll wait. There is EVERY kind of advice out there. 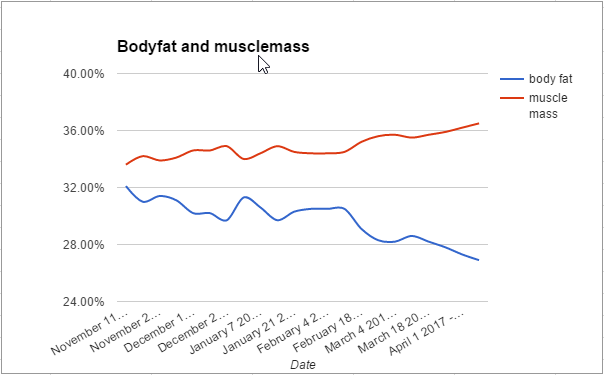 I have made the mistake previously of doing overly complicated routines that require all kinds of exercises and 2 or more hours in the gym every workout 5-6 days a week. The workout I have chosen to start with is called Stronglifts 5×5. It incorporates heavy compound lifts to build strength. You start out light and move up with every workout. I have already started to plateau on some of my lifts, which is a good thing. After a bit I will most likely switch to a different 5×5 variant called madcow 5×5. But I gotta earn it first. I have ramped up intermittent fasting as a healthy lifestyle choice. I enjoy not having to worry about getting hungry every few hours. 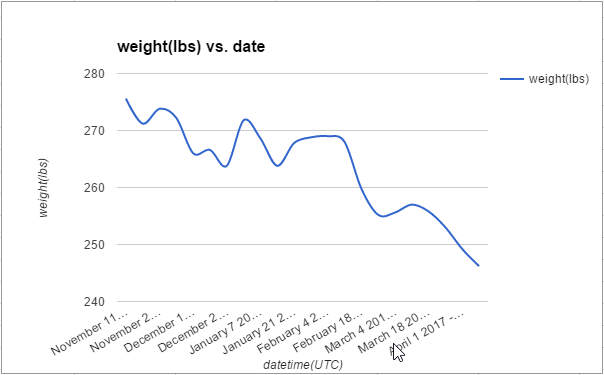 In January I’m experimenting with OMAD (One Meal A Day), but more to come on that later. I have also begun spinning (stationary bike) for a cardio workout, which feels fantastic as I am not a fan of running. I am also doing my cardio prior to my one meal of the day so I am in a fasted state. Your mileage may vary, my mileage may vary. I’m trying to experiment and see what works for me. What I know for certain is that what I’ve done for most of my adult life hasn’t worked, so I need to change it. For me, it’s physical that I want to change most because in every other aspect of my life I’m perfect. Don’t believe me, just ask.